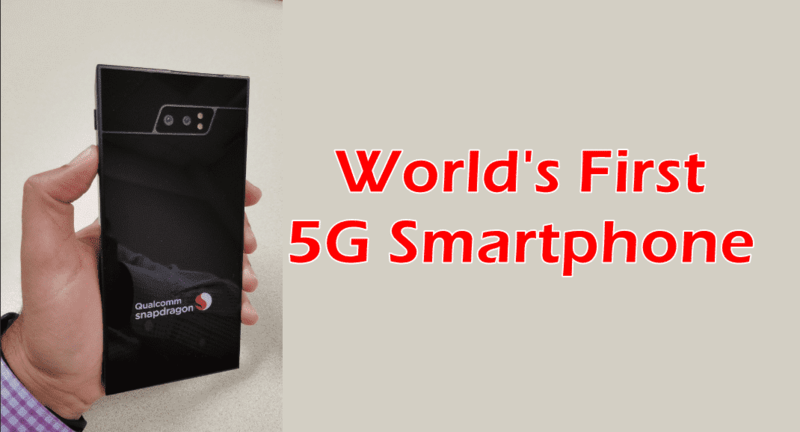 Have you seen the world’s first 5G smartphone on Twitter? The next generation of cellular technology, 5G (fifth generation) is expected to be standardized and available to general users by 2020. In order to experience unprecedented levels of speed and responsiveness using the future 5G technology, many smartphone manufacturers are working on developing 5G enabled mobile devices for its customers. The image above is a prototype of Qualcomm’s first mmWave 5G smartphone, which was developed to test and make necessary optimizations to their 5G mmWave performance within the constraints of a mobile form factor, according to Digit. Coming to its features, the rear of the phone has a horizontally aligned dual-camera and vertically aligned dual LED flash plus a Qualcomm Snapdragon logo at the bottom of the device. The smartphone is expected to support multimode 2G/3G/4G/5G bands. Besides these, no other details were divulged. Also, to ensure that the 5G tech is a success, Qualcomm is working with cellular carriers like Verizon and Sprint as well as parent company Softbank, on 5G tests and technology. The chip maker recently demonstrated the first-ever 5G data connection made by a single chip – the Qualcomm Snapdragon X50 5G at the 2017 Qualcomm 4G/5G Summit. The company was able to achieve download speed of more than one gigabit per second and an over-the-air connection using a tiny 28 GHz mmWave antenna module.